NMWHIT MOTWC – Round Three! A particularly bizarre winning entry for the NMWHIT MOTWC this time – and that's by the No Monsters Were Harmed In The Making Of This Website Competition's fairly exacting standards of bizarreness! The judging was very tough this time, but it gives the WebSphinx and I great glee and delight to announce that the winner of Round Three is SANA AND HINA, with their extraordinary BEETLE IN HONEY. John Lee's outstanding, award-winning audio version of Black Tat is on its way to them now. The NWHIT MOTWC ball is really rolling: some amazing imagery has been coming in. Why not have a crack at it yourself? 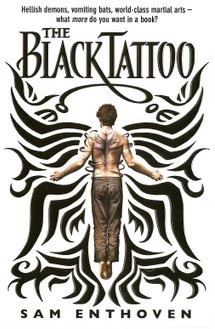 Black Tat makes prize shortlist! Tim, Defender of the Earth, my follow-up to Black Tat, is now finished and about to go off to the printers. I've spent most of the summer planning the project that comes after that, and now it's time: this week I started writing my latest book. It doesn't seem to matter how many books I've written before: the first few pages of a new one are always tough, I find. Everything you write is subject to change later. The characters are strangers to you, the setting is unfamiliar, the story is not clear yet – and to top it all, it always feels like you've suddenly somehow lost the ability to string a sentence together: AARGH! For me, first drafts (or 'zero drafts', as I sometimes call them) are all about getting to the finish line: getting everything out of your head and onto the page, crashing through it all as best you can, so that later – much later – you can look at what you've got, and see if you can turn it into a book. Sometimes, magically, you can end up with something you're pleased with. But man, there's some grief to go through first. DEFINITELY don't – I mean it. Whatever you might be imagining about a life of writing, it's not like that. OK, if you're going to anyway, if you're going to be a writer of any quality, you will have to commit yourself to writing – which is something that, when you're young and idealistic, sound incredibly easy to do, but you should commit yourself to writing almost as if you were some ancient Greek or Egyptian committing yourself to a god. If you do right by the god, then the god may, at some point in the future, reward you. But if you slack off and don't do right by your talent or your god, then you are heading for a world of immense and unimaginable pain. If you have a gift that you choose to pursue, then you have to pursue it seriously. Don't be half-assed about it, but realize what that commitment means. Committing yourself to writing will mean, to a certain extent, your writing will become the most important part of your life – and that's a big thing to say. It can have a distancing effect upon other relationships. It can be sometimes quite a solitary life. If you're commited to writing, you're going to spend most of your life indoors in a silent, empty room, concentrating on a pen and a piece of paper or their equivalent. Be prepared to take it seriously and be prepared to follow where it takes you, even if that takes you to some very strange places. I love finding quotes like this. They're comforting, because they remind me that (contrary to the impression you might get in some blogs!) most writers don't pop stories out like a toaster pops out toast: they sit in rooms, and work for them. Writing is a job - and as a certain Canadian singer (whose name I won't mention!) once succinctly put it, "Ain't no use in complaining when you've got a job to do." Updates to this page may slow down a bit over the coming months. To be frank, there's only a certain amount of "he sat there making things up and occasionally tearing the last of his hair out" that I imagine you'd want to read anyhow! ;p But before I run off to go play with my imaginary friends again, I just want to say one thing: THANK YOU. I've been receiving some lovely messages in the Black Tat Guestbook lately. The fact that one of my stories (and soon another!) is out there and being enjoyed by people... well, that makes the work worthwhile. Thank you for taking the time to write and tell me so. I appreciate it perhaps more than you know. This was a treat: yesterday I was in Edinburgh, Scotland! My UK publishers, Random House Children's Books, fixed up the trip, as a way to publicize the new paperback of Black Tat, just out over here. It takes a bit under five hours to get from London to Edinburgh by train: I went for the day, coming back on a sleeper that brought me home at 6.30 this morning! As you can see, they looked very purposeful and were obviously on their way to something important, so I didn't try and stop them to chat. The evening's event was a lot of fun. Here's a pic of me waving my arms about, as usual. I took a taxi back to town and, with a few hours to kill before my train, treated myself to a slap-up dinner of haggis, with neaps and tatties. I'd never had haggis before: it's absolutely delicious! Then, after what had felt like quite a long day, I fell into my sleeper carriage and was gradually rocked to sleep by the movement of the train through the night. Lovely. Here's hoping next time I come to Scotland I get to stay a bit longer! This just in, a very nice little animated thingmajig (I believe that's the technical term), as created by the Random House Children's Books UK team to promote the spanking new Black Tat paperback! Nice, eh? Hee hee hee hee! NWHIT MOTWC – Round Two! And... yes: WE HAVE OUR SECOND WINNER! The WebSphinx and I are delighted to present another winning entry from our ongoing No Monsters Were Harmed In The Making Of This Website Competition, this time in the shape of this beautiful image by SKULLIAN, of South Wales. Be sure to click top right to find out what (or in this case who!) the image is made from! Skullian's prize, John Lee's awesome unabridged Black Tat audiobook [see here for details] is on its way to him right now, together with our ENORMOUS THANKS AND CONGRATULATIONS! Meanwhile, Round Three of the competition has begun, and closes late September. Fancy your chances? Get snapping! My LibraryThing List has now reached the five hundred titles mark. That might seem like sort of a self-indulgent thing to mention here, but in fact that list is facet of the masterplan that I'm particularly pleased with – one I've got very high hopes for. Let me explain. As you may have read elsewhere on this site, for ten years before I got my break as a writer I worked as a part-time bookseller, at Blackwell's in London's Charing Cross Road. Ten years is a long time, and (apart from my colleagues, who were and are terrific!) the main thing that kept me coming back to that job – the main thing that I miss, now I don't do it for a living anymore – was recommending books, especially to and for young people. To my mind, there are few things more satisfying than picking out a book for someone, knowing they're going to love it. Mind you: once in a while my customers were kind enough to come back and thank me, and that was even better! Well: this LibraryThing business is the closest approximation to that I can currently get. Of course it's not like being in the shop: I can't work with anyone individually to find something that exactly suits them. But this approach has got certain other advantages...! If the list is too bulky or intimidating for you by itself (fair enough, 500 titles is quite a few!) then there are a couple of other easier ways you can get into it. There's the LibraryThing Widget on the right hand side of this site's Fun Stuff page. That'll pick you out something from the list at random: if what you see doesn't tickle your fancy, just hit 'refresh'! Alternatively, my LibraryThing profile page gives you a few other angles (links to reviews, 'author cloud' and so on – isn't LibraryThing awesome?) Plus, it's another place to leave messages for me if you like. Today was my birthday: 33 years old – nearly a third of a century! Also, it was the day that Laura and I got our new bookshelves. They were specially built and installed: they had to be, to fit into the stairwell of our flat, which is a very odd space – not especially wide, but wonkily angled and enormously tall. 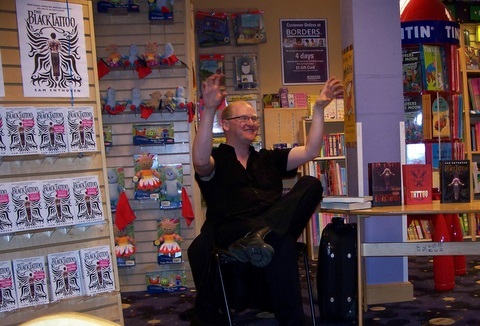 Here's a pic: to give you an idea of scale, I'm over six feet tall (not including the long tentacle-like arm I'm waving!) 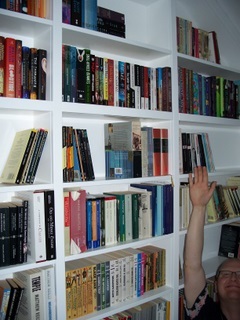 The highest shelves are off the top of the picture, so high that we need a special ladder to reach them. And yes, for the first time in years (until we fill it, of course!) THERE IS SHELF SPACE! Today the US Advance Readers Copies arrived of my next (completed!) book, Tim, Defender of the Earth. As you'll probably be able to tell from this pic, I am very excited! This is the very first time Tim has looked like a proper book, as opposed to a stack of paper or a file on a computer. Now, that's a big moment for me: it's only happened once before, with Black Tat, and I tell you, the novelty of the sensation is showing absolutely no signs of wearing off so far. And check out that awesome US cover art from the Razorbill team! I'll put up a more detailed image when we're closer to the time, but... HOO-WAH!! OK: (says he, trying to calm himself down, more than anyone else...) it's important to note that this is not the finished article. As is absolutely traditional at this point, my editors and I are still picking out various little snags, bugs and blips in the text that will need to be tweaked before the final thing goes off to press prior to its launch in March next year ('08). This is sort of a 'rough version' of the book: ARCs are for promotional purposes, essentially made to show to booksellers, so they can decide early on if they like the book and how many copies they're going to order. But I think Tim is looking great already, and if (as I hope you do!) you agree... well, believe me, the finished article is going to be spectacular. It'll be a hardcover, and for this one (the US edition) I happen to know there's going to be an absolutely gobsmacking full-colour gatefold painting of one of the key giant monster scenes of the story, bound into the centre of the book! That's an incredible piece of art, btw: I can't wait until a little closer to publication when I can show it to you. 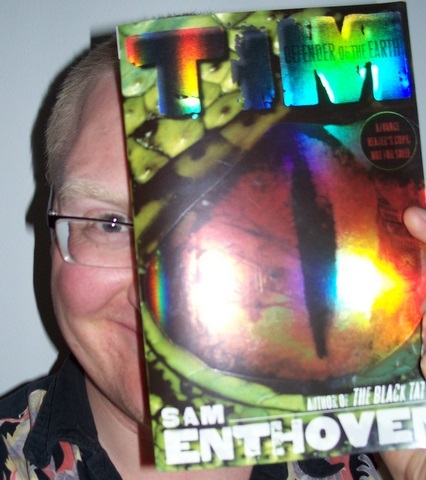 But meanwhile... Tim is a book at last - and right now whenever I look at it I have to go and jump around the room. Excuse me: HEE HEE HEE HEE HEE! EIGHT HUNDRED Buddies for Jagmat! Well well, Jagmat, you have been making friends I see. And I haven't noticed your lurking, clammy presence around the place quite so much these last few weeks. Can it be that the Earth isn't quite the "pit of a planet" you've been making it out as? I can't believe you'd really still keep hanging around this side of the Fracture - when you could be ruling Hell! - just to settle some petty score with the likes of me. Admit it, mate: you're enjoying it here! So why don't we just drop the nonsense, let bygones be bygones, and meet for a drink or something? What do you say? Black Tat UK Paperback YAY! I've received my first copy, so it'll be in shops any day: The Black Tattoo is about to come out in paperback here in the UK. HURRAH! Now, I love hardbacks: I love the feel of them and the way they look on the shelf. But folks, I have to be realistic: while I'm thrilled and stunned by how well the hardbacks have been doing (particularly in the US – amazing!) let's face it, I'm a newbie, a first time writer, and buying my debut novel in the more expensive format must look like a risk to someone who doesn't know anything about me or my stories. [Plus, as my mother wisely points out, hardcover books are 'much too pointy' if you fall asleep while reading them in bed!] Folks, it's simple: the reason I'm doing this is because I want people to read my stuff, so I'm DELIGHTED that Black Tat is available in a cheaper edition at last – especially one as nicely produced as this one is. You know what? I haven't got my head under a stone, so I guess I'd better write something here about 'you know who'! I'm not a Harry-hater. Hell: I couldn't be, even if I wanted to be. Say what you like about the series (book four was my personal favourite; five made a better film than it did a book, imho) - the simple fact is, it would've been much tougher for me to get my break doing what I do if it wasn't for the trail blazed by Harry, Hermione, Ron and co. We're in the middle of a golden age for young people's literature: there's more excitement, more experimentation, more potential in this field right now, I believe, than in any other type of storytelling, films and games included. That's down to Harry Potter. Ten years ago it would have been unthinkable for publishers to put the kind of weight and money they do now behind any book for eleven to fifteen year-olds, let alone some of the incredible stuff that's being produced at the moment. With their phenomenal success, the Harry Potter series has focussed the world's attention on this crucial reading age: J K Rowling's hard work has inspired a whole generation, introducing them to a pleasure – books – that they will savour for the rest of their lives. I think all authors owe Ms Rowling a debt of thanks, and me more than most. So, Harry Potter, here's to you. OK: it's only a placeholder right now, in case people find the address in the marketing literature on the back of the limited edition Advance Reader Copies about to be sent out (hurrah!) to booksellers across America. But I'm still HUGELY excited, partly because I've seen the full size US jacket art (glimpsed there!) in all its gobsmacking glory – and partly because the WebSphinx has told me her awesome plans for the new Tim site. So you see: I know what's coming. I'll be sure to keep you posted here about any further developments (including one particular piece of Rather Thrilling News that I'm still not allowed to tell you about yet!) But now you know: the countdown has begun. HEE HEE HEE! Over the last few days I've been having a terrific email correspondence with Jared, a gentleman and bookseller from Bakersfield, California. It's always a pleasure swapping thoughts and ideas with someone as passionate about young people's literature as Jared clearly is. He's been asking me all sorts of excellent questions about Black Tat and about the writing life generally, and I've been having a lot of fun answering him! To see those questions – and quite a few others, now! – head over to the Q&A page. And thank you, Jared! Here's an excellent suggestion that came from the Guestbook – thanks, Lauren! Over on the Fun Stuff page of this site the WebSphinx and I are proud to present a brand new feature – a Reader Art Page. We've put up a few fine items to get the ball rolling, so be sure to check those out (particularly my friend Elaine's amazing hand-knitted Chinj!) If Black Tat has got your visual creative juices flowing, then send a jpg or ten to the email address provided. We'd love to see whatever you come up with! Wow, can it really be a whole year since my first ever school visit, to Park High School? What an absolute treat to come back and get the chance to talk about my adventures. My thanks to everyone at Park, staff and students, for extending me another wonderfully warm welcome. To anyone who's been waiting for me to post about this visit, I should also offer my apologies for taking so long. I'm sorry, but the last few weeks have been absolutely MENTAL: not only have I had builders of various kinds crashing around in my flat (for a week I couldn't even get into my room!) but I've also had a couple of items of AMAZING NEWS about my stories. It's all hush-hush at the moment, contracts are being negotiated as I'm writing this, so I'm afraid for now I'm going to have to keep it under my hat. But the titfer is positively trembling on my forehead: I can't wait to tell you what's happened, so watch this space for details! Read earlier news posts here.